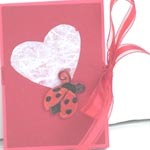 These hand made and painted cards are mostly 3 dimensional, booklet style cards or sets. There are an assortment of themes but mainly dealing in birthday's and friendship. All prices are in Canadian funds plus a shipping and handling charge of approximately $2.00 within Canada (for international orders there may be a slightly higher mailing cost). GST/HST will be added where applicable. NOTE: Click over image to enlarge and to see a description and size etc. "MC July/13 - Star Booklet - HB"
Made for a friend who is feeling down. Flag Booklet Friendship Birthday card. 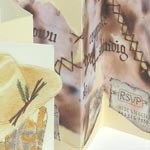 Accordion Envelope style card featuring a funky style alphabet and quote.